I Need a 'Cool Dad' Car for $60,000! What Car Should I Buy? 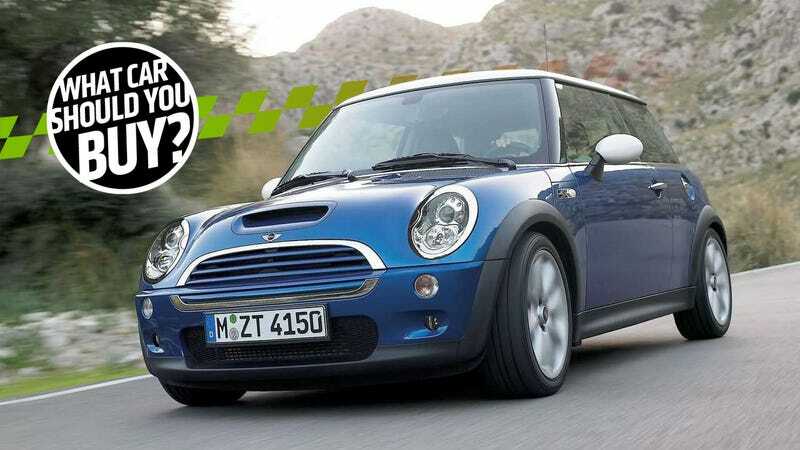 Sam has a 2005 Mini Cooper S, which is a fine little car, but not quite practical for a growing family. He wants something sporty, fun, and practical and has a pretty healthy budget to accomplish this task. What car should he buy? I’m a new dad who needs more space than my ‘05 Mini S (manual) can provide. We’re planning on having a second kid in the near future, and I’d love to be able to operate car seats without dying and not need to drive with the steering wheel in my throat. At the same time, I’m not at all ready to hate my time in the car. I need space for two car seats in a reasonably sized car that can still fit in my garage and parallel park. I would like something that is a sneaky joy to drive (think performance lines from mainstream brands). I would love something like a CTS-V wagon or E63 wagon, but I don’t know if I can get a decent example with a $60,000 budget. Also, I would prefer something with AWD and it does need to be an automatic. First of all, good for you for even attempting to make a Mini Cooper work with one kid. That can’t be an easy task, but once kid number two enters the picture that will be a futile exercise. Since you are a Jalopnik reader you already know that the wagon is the best solution, and you have predicted correctly that the problem is going to be your budget. The collectability of the CTS-V wagons have priced all the good examples well north of $60k, and you can thank a certain YouTube personality that used to work here for the rising cost of E63 wagons. That’s not to say you can’t find a nice used E63 for under $60,000, but it will be a challenge. The other issue with those cars is the size. Coming from a Mini they will feel gigantic. For the easy of parallel parking, you may want to find a middle ground. You may be tempted by the Volvo V60, which is almost worth it for the seats alone, but will be kind of a let down from a strictly wagon perspective since the actual usable cargo space is pretty small. My suggestion would be a newer BMW 3 Series wagon, or the F31 as the BMW geeks call it. These cars are readily available in your budget either new or used, with the certified pre-owned option giving you the most for your money. The 248 horsepower four-cylinder feels quicker than advertised and the eight-speed automatic is actually kind of enjoyable to pull the paddles and run through the gears yourself. It’s not a large car, but kids should be plenty comfortable in the back and the rear cargo area can hold a ton of gear. Here is a CPO 2016 with an M-Sport kit for only $34,000. With that kind of savings, you can buy yourself a cheap sports car with a stick for the weekends. You know, Sam, I’m something of a “cool dad” around here myself. I don’t have my own kids, but I play blog dad every day to my beautiful car sons and daughters at Jalopnik, most of whom can’t figure out Google Calendar or how to file expenses properly. But I love them no matter what! And when I need to haul my Jalops to the hospital to get a tetanus shot for the thousandth time, or to their various court-mandated community service activities, there is only one vehicle that fits the bill: the Cadillac CTS-V wagon, which you yourself say you’re interested in. I think you should go for it. The good news is that while these things are rare and seem to be rising in value, they’re not impossible to find. Not yet. I found you one in Chicago with just 55,000 miles on the clock for way under your budget at $40,800. A bit much for a used Cadillac, yes, but it’s a weird and desirable bodystyle with a screaming 556 HP supercharged V8 under the hood—and this one claims over 600 with some mods. And it has the automatic, as requested. Buy this gem before another dad beats you to it. I hate to admit it, but BlogDad is right. You shouldn’t accept anything less than the best, and the CTS-V is it. Failing that, I’m a huge proponent of the E63 Wagon. They’re out there for the money and, as a bonus, you can buy one secure in the knowledge that its value won’t plummet. But you’re not here to read about cars you already thought of! You came to us for new ideas, and your humble Macktern is here to save the day. Consider, if you will, the X5 M. Not only can you get these for your money, but you can get the current-generation model that came out in 2015. You won’t have to cope with a previous-generation Cadillac interior, with 2011 GM tech. Instead, this example I found with 69,227 miles for $53,999 has a surround view camera, active driver assists to keep the family safe and rear-seat entertainment to keep the lil ‘uns quiet. And of course, a 567-horsepower twin-turbo V8 that spins all four tires. I don’t know a whole lot about the space requirements needed for children or car seats or strollers, or really, any of that. But I’m not convinced you need a wagon for only two small humans. What I am convinced of is that each of those kids require at least six cylinders. Ferrari understands this. Be like Ferrari. Kids don’t like sharing, we all know this. So when you open your hood, you’re going to want to avoid conflict by assigning each child their own bank of cylinders. In the case of the Cadillac or BMW M, your kids have to grow up with only four cylinders apiece, and that’s not living, is it? In the case of that BMW wagon, you don’t even have two banks to split! You could divide the front two from the rear two, but believe me when I say: Children don’t share banks of cylinders. It’s a proven fact. Clearly a V12 is a necessity, here. And because there aren’t many V12 cars left, and because my friends with children complain about how expensive and messy those mini versions of themselves are, I say you should buy something used, like the BMW 750iL shown above. It’s $7,500, and comes with not only 12 cylinders of fury, but a proven ZF five-speed automatic and tons of space in the back for child seats. With the remaining 50 grand, you can even send a kid to college. Well, for a semester at least. I Go To College In The Middle Of Nowhere! What Car Should I Buy?